On May 2nd 2008 when a Cyclone warning was issued, nobody took it seriously because severe tropical storms are unusual in Myanmar. Even if people had known the risk, the warning came too late. The morning after there were 140,000 people dead. For those who survived life would never be the same, and for many of us who got involved in the relief and recovery operation life also changed. From all the service projects we implemented after the calamity, I will focus on the child centres. The area where we are working is the Ayeyarwady river delta. The river starts on the Himalayas and after crossing the Myanmar planes it breaks into thousands of rivers which pour their waters into the Andaman Sea. The delta is a vast and fertile low land; the people are poor paddy farmers and fishermen. Immediately after the storm we set up four Child Friendly Spaces (CFS). The purpose of a CFS is that after a natural disaster the children can have access to a place where they feel safe and where they can be engaged in activities which help them to recover a sense a normalcy in their lives. Most of the children coming to our child centres lost family members and saw their houses destroyed during the cyclone. 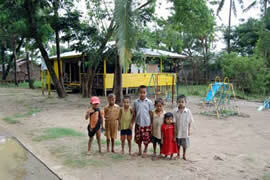 The Child Friendly Spaces also help to report on child abuse, like violence and child trafficking. After natural calamities it has been reported that certain individuals go around acting as adoption brokers. The child centres monitor children who have been separated from their families so that they can be reunited with them, or in case they have been orphaned, the workers coordinating the CFS will make sure that the children are put under the care of their relatives or at least members of their own villages. In the international humanitarian community this alternative care approach is preferred instead of putting children into large institutions or orphanages were they don’t get any family feeling and where often abuse cannot be avoided. Child Friendly Spaces are provisory measures operating only during the emergency period which follows after a natural calamity. Normally they function in a tent or in a community hall. For the Myanmar operation we got plots of land in four different villages on an Island. There we built the wooden structures for the hall, kitchen and toilets. The idea was that after the 6 months of the emergency period, the communities would utilize the wooden structures as community halls or if they were interested they could run the child centres on their own. 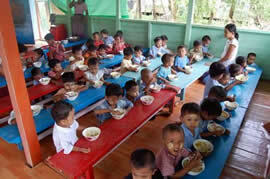 Two coordinators were hired to supervise the child centres. During the construction period they hired and started training teachers from the same communities where the child centres would be functioning. The concept was totally new, especially for these villages in the Myanmar Delta region where there’s no pre-school education. In the beginning the teachers thought that we were going to teach some academics and the children were asked to sit in rows to repeat the lessons like in the traditional Burmese system. We instructed them to sit in circles and make small groups and assigned a teacher for each group. This change was enough to let the teachers understand we were bringing a different concept. After that the teachers themselves expanded and enriched every idea we proposed to them. Not only that, but also they came with their own ideas and creativity. The environment at the child centres became warm and joyful. Our routine is not much different from other pre-schools: games, singing, dancing, story telling and lots of art, asanas and meditation. What makes the difference is the attitude of the people who are involved in the project. We were very fortunate to have found them. It’s very clear the love and seriousness the teachers apply when dealing with the children. Usually it is easy to have spiritual ideation with children around; in this place this fact is more evident. After the six months of the emergency had passed, we were considering to handover the CFS to the communities as it was the original idea, but our donor was so satisfied with the standard of our work, that we received a grant for one more year, and the Ministry of Social Welfare up-graded our status from Child Friendly Spaces (CFS) to Early Childhood Care and Development Centres ECCDC or ECD in short; that is what pre-schools are called in Myanmar. We brought two of our teachers to Yangon for a formal training and after that they went back to the villages to share their knowledge with the other teachers. We have regular training sessions once a month and the teachers from all four centres come with their little boats to get new ideas, share their experiences and check that the ECD standards are followed. These standards were proposed by UNICEF and some well know international NGO’s specializing in child protection. Inspired by the success of the project our donor recently gave another grant to build four new child centres in 4 other villages, which means that we will be running a total of 8 pre-schools in Myanmar. 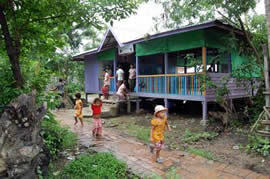 The new child centres will be built in an area were we have done house reconstruction. These centres will be also operating for one year before they will be handed over to the communities; but it will be better if we can operate them on a permanent basis, because the villagers are not in financial conditions to pay salaries, equipment and maintenance and also because we know how to run the centres and thus keep increasing the standard. We have received comments that the children who graduated from our child centres are performing better in the primary school than the others who didn’t attend pre-school. Another significant point is that we are providing housing and education to communities who lost the little they had before the cyclone. Our standard is more than progressive for a developing country situation; still we would like to create a neohumanist environment based on exemplary teachers and a curriculum with spiritual content.